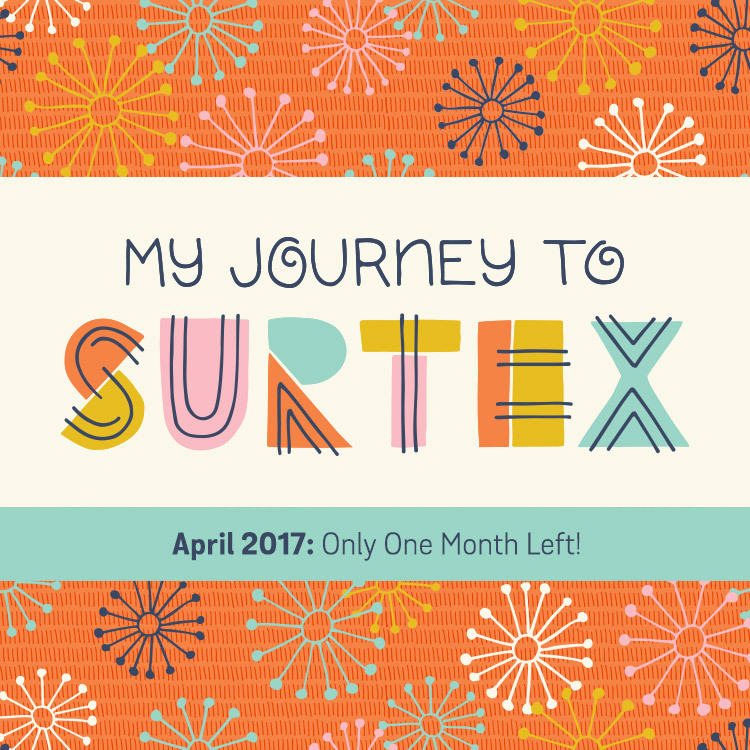 My Journey to Surtex | April 2017 Update: Only One Month Left! Exactly four weeks from now, I'll be hopping on a plane to New York and gearing up to exhibit at Surtex for the very first time – and it feels so surreal! This past month of prep has been very intense, but I'm happy to report that I've had a very productive and mostly positive month. I feel like April was definitely my "in the trenches, get it done" month in terms of Surtex prep. Over the past three weeks, I've ordered nearly everything I need for my booth from fun giveaway items to sample products showing off my designs to the all-important booth banners (can't show those yet, I want to keep them a surprise!). It was also a busy month in terms of marketing. I signed up for a trial month of LinkedIn Premium so I could track down the names of art directors for the companies I most want to work with. The scariest part??? Actually contacting them with an InMail message hoping for a response. It's a pretty humbling experience to put yourself out there, hoping that companies like what you do. Social media is another thing I've been focusing on as I've started posting the previews I spent a lot of time working on in February (like the example below). It's important to post regularly to Instagram, so I'm sharing snippets of new work and trade show prep in-between Surtex previews. And because automation makes life SO much easier, I already have ALL my preview images between now and the show uploaded to Later.com with captions so I don't have to think about it. However, I always strive to be honest about my artistic journey, so despite accomplishing a lot this month, I want to share my setbacks too. One place where I feel like I've "fallen behind" a bit is in creating new work for my portfolio. Since my March Surtex update, I've only managed to create five new pieces instead of the 8-10 I was hoping for. I know that my creative energy runs in cycles, but this past month has seen a dip in energy, even in my most creative periods. It's hard to pinpoint just one thing to blame my lack of creative energy on as it's usually a combination of factors, but one important difference between this month and last is that I've started overthinking things. In times of extreme stress, I typically default to what I affectionately call "worry wart mode" and until now, I've been fairly good at managing my stress level and taking time off when I feel I need it. But now that the show is actually right around the corner, I've found myself starting to nitpick and revisit every decision. From theme to color choices to the overall presentation of a design, I've been doubting everything. Sometimes I get so caught up worrying about what buyers and art directors might want to see that it's been almost paralyzing. So much so, that I took this entire week off from creating any new work to give my creativity tank time to refill. Constant creativity is hard, so it's important to know when you need a break, and it's something I relearn over and over again. I absolutely LOVE what I do for a living. That moment when I get a pattern to repeat perfectly or I finally master a new technique in Illustrator – it truly makes me giddy! But it can be easy to lose sight of that when I start to worry about what others think (art directors or otherwise). A very wise fellow designer recently said to me that I should "design for one", create the things that make me happy, and everything else will fall into place. It's great advice and I'm going to keep that in the back of my mind as I run towards the Surtex finish line. I'm sure you've heard the saying "it takes a village to raise a child." Well, I believe the same is true when preparing for a trade show while also trying not lose your mind. When I made the decision to exhibit at Surtex last year, it was just me. And you know what?? It was lonely first couple of months. I was still finding my footing, but I knew I needed help if I was going to be successful and stay sane. First, I asked my husband for help and he could not have been more supportive – he'll even be working in my Surtex booth with me! And while my husband's encouragement has been wonderful, it still wasn't enough. I needed someone else; someone who knew exactly what I was going through. That's why I'm so grateful for my accountability partner and fellow Surtex attendee, Lizzie Clark. She reached out to me at the end of 2016 and we've been in constant contact ever since. We schedule Skype chats every other week and email in between to keep each other on-track. She's been an incredibly supportive partner-in-crime and I can't wait to meet her in person next month (and luckily she's only 2 booths down from me!). I've also been thankful to be part of Jennifer Nelson's Facebook group Advice for Artists. It's a large group of incredibly knowledgeable and encouraging group of designers where you get really thoughtful answers to your questions. Another place where I've been able to connect with many fellow designers who are always eager to encourage each other is Instagram. And while I've heard many say that the industry can be very competitive and cutthroat, I'm lucky that my experience with other surface designers has been nothing but positive. So my lesson learned this month is that if you're considering signing up for a trade show or embarking on a big new business endeavor, don't go it alone. The journey is way more fun (and A LOT less stressful) if you have a village of support around you.